Inner sleeves were readily mixed up and I suspect the poly-bag was often replaced with a more modern sleeve with more convenient functioning. At least half my Esquires have an EMI poly-lined paper inner sleeve or similar from a decade later. Do any of the Esquire poly bags (like the one with the Monk LP) have MADE IN ENGLAN printed on them quite small in red? I have a few of those and was wondering if they are Deeca sleeves. How long is your Monk poly bag from base to top? Most of the other half-moon polybag examples I have do not have a fold-over flap. They are trimmed at the record shape, 31cx31cm. I cant see any print on the polybags. 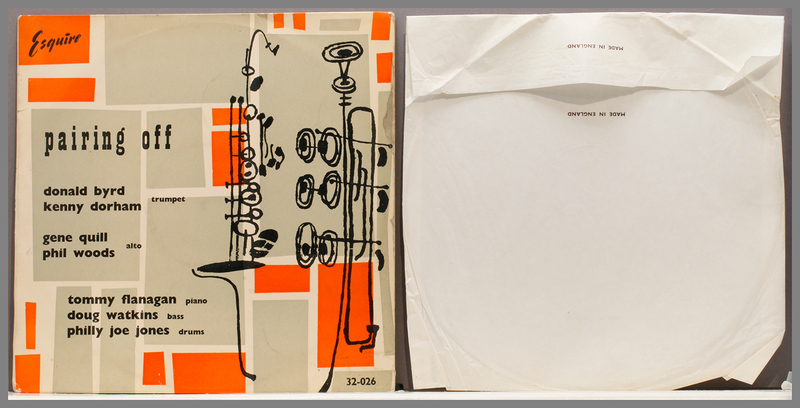 The paper sleeves are definitely Decca. I have Vogue ones that are indistinguishable. So 32-115 and 32-119 would have both originally come with a baggy polyethelene sleeve? And 32-045 would have probabbly come with a tight plastic sleeve with the blue patent sticker on it and maybe the paper foldover sleeve too? JOHN, I saw yours only today. Yes, 32-115 and 119 came originally with these loose bag type inners. Not the tight ones with the blue patent sticker. My 32-045 is with the Decca/Vogue inner. Looking at Andrew’s sheet above: I have the same outcome. I don’t have 32-035, but it should be correct, since my 034 and 036 have the same inner sleeves. I have had to let the butler go – my Esquire information is in a mess. You are telling me things I have paid insufficient attention to in the past. Some have the price including purchase tax, some do not. I am exposed as a mere diletante, a charlatan. I am going to have to up my game. Results of a rapid analysis of the back covers of my sixty Esquires reveals many things I was unaware of until now. This are my initial conclusions, which may or may not be right, however anyone is welcome to shoot me down. Just be wary of the butler concealead in the bushes: instead of firing, I promoted him to my bodyguard. forgot to mention that 1st issues have a spine with the album text, whereas the 2nd editions have a thin spine and the album title + catalogue number on the back, 1/2 cm to the right of the spine. Interesting discussion. My first brand new Esquire, bought at Dobell’s in the very early sixties, catalogue number 32-019, has two inner sleeves: a tight plastic sleeve with the blue patent sticker on it. A plain flipover paper sleeve which houses the plastic sleeve and the record. Double protection. It all matches perfectly with the art sleeve. Later Esquires, up to say 32-090 – 100 have polylined sleeves with thick paper as used by Decca for their early Vogue issues (“this long playing record is a high precision product”). 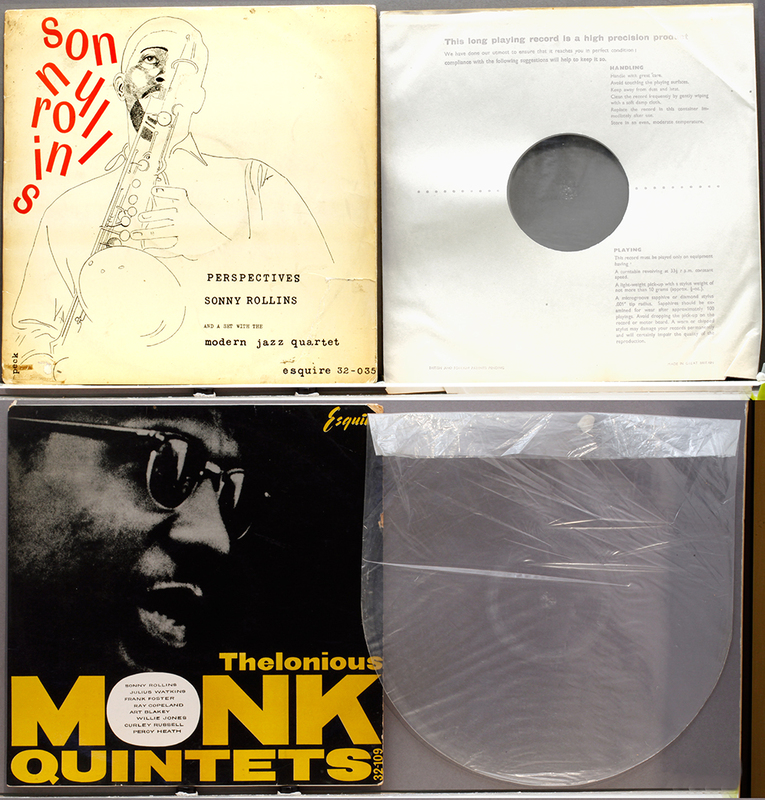 Thereafter, until the demise of the label, comes the period with baggy polyethelene sleeves as shown next to 32-109. E.g. my 32-085, bought new from Dave Carey in the sixties, came with the thick Vogue sleeve. IMHO the EMI sleeve next to 32-115 is not authentic. Second pressings of course have later inner sleeves. My 2nd pressing of 32-046 has a baggy polyethene inner sleeve, like Andrew’s 32-109. The later issues are recognizeable by their lower price 37/9 1/2d., iso 39/ 7 1/2d. and they have a cover which is not laminated on the back, apart from the flip-over part. Is the butler at rest with a pousse café?